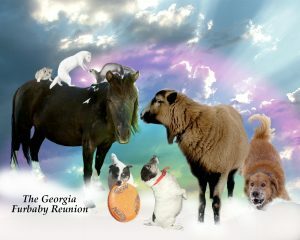 It has been over 11 years since I found my best yardsale find ever. A family was selling off a lot of things from an estate and had no idea what they had (which often happens). 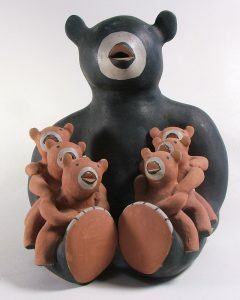 Sitting on the table were these two pottery figures, a bear with six little bears in his lap and a drummer boy. I could see they were hand made and signed. The lady selling them told me they would look nice in a garden. Price? They were only $2.50 each. Of course I took them. When I got home I started doing research. There was not a lot on eBay for comparison, so I contacted a dealer in New Mexico who seemed to have some similar pieces. He got back to me and said that the bear was made by a Cochiti Pueblo man named Louis Naranjo. He was known for making bear storytellers. Mr. Naranjo was no longer living and had work in the Smithsonian. 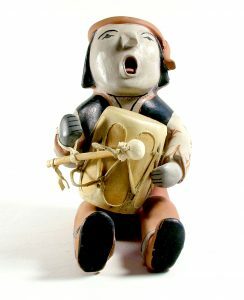 The drummer was made by a lady from the Cochiti Pueblo named Ada Suina who is considered one of the finest active Cochiti potters active at the time. The background colors on the face and clothing come from colored slip that is getting difficult to find. The dealer told me that he had known both people, and that Ada Suina was not making very many pieces now. He offered me $1400 for the two figures. Believe it or not, I almost did not take it. While the money could be put to good use, the opportunity to own such beautiful pieces of art would most likely not come again. However I knew that it would be sad if one should get broken or damaged and it would make sense to let them go to a true collector. Sometimes I do regret selling them. I have decided to write about some of the more interesting things I have found on my “hunts”. Shell necklaces, you see them all the time at yard sales and thrift shops. I almost passed it up that morning. The lady had some nice vintage jewelry and great prices. As I was ready to leave, I decided to buy the string of shells to add to the morning’s little collection. After all, she was only asking $1 for them. She said they had been her mother’s. Later, I went through the jewelry and was well pleased with it. At the bottom of the pile were the shells. They were very light weight and tiny. The color intrigued me, though. 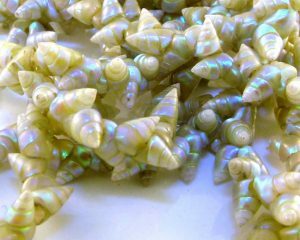 The shells had a blue sheen as pretty as a lot of opals. I figured it might be interesting to try to find out what they were. Shell necklaces don’t bring much, as a rule, but it would help the description if I could identify them. Typing in a search for “small iridescent blue shells” I came up with quite a few results. Surprisingly, one on eBay was going for over $300. That got my attention. The photo did look a lot like the strand I had. They were calling them “marineer” shells and they were from Tasmania. Next search was for marineer shells and Tasmania. It produced more photos and information. Sure enough, the strand I had was marineer shells. It appears that the shells were probably more than 50 years old. The tiny marineer shells are only found in a small area in Tasmania, and they are very rare. The Aborigine people have been using them to make necklaces for hundreds of years. Presently the gathering of these little beauties is restricted to only a few women of Aborigine heritage. 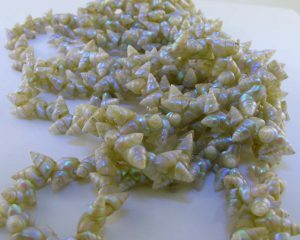 It can take a year or more to find and clean enough shells to make a necklace. Mine was over 50″ long. Most of these older necklaces are in museums in Australia. I listed mine on eBay, and received email from people in Australia who were very interested in buying it. The necklace sold for a nice price to a woman of Aborigine heritage who was very excited to find one of the rare strings. My pretty little shells went back home to Tasmania in a black velvet case, suitable for a national treasure. The buyer was thrilled. Over the years, a few people have contacted me asking if a necklace they found was marineer shells. Most are not. A small, polished troca or a turbo shell sometimes looks a lot like a marineer shell. The marineer shells are very small and sort of elongated. I have seen a few strands for sale that were definitely not marineer. Be sure to do your research. 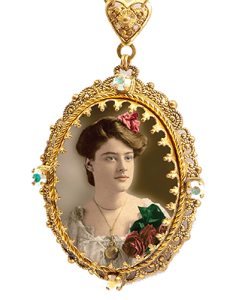 The old necklaces are usually on string.